Although there were only two Ferraris in the automobile section of the auction, a 340 America Touring berlinetta, chassis # 0126A, and a 365 GT4/BB, chassis # 17861, there was an interesting selection of Ferrari related items in the memorabilia section. These ranged from a wartime personnel pass for the then Auto Avio Costruzioni factory, through various sales brochures, to an original homologation sheet for the 500 Mondial, proof pages for factory yearbooks, photographs, and posters on the paper front. Other rare items were a 126 C nose cone and front wing, damaged by Gilles Villeneuve during a test session at Fiorano, and autographed by him, and a large plastic dealer panel sign. Neither Ferrari reached their reserve price, but the unique ex-Peter Daimler Maserati A6G-2000 Zagato spider, chassis # 2123, although not the prettiest thing to leave the Zagato shop, found a new home at £174,280-00. In the memorabilia section the Ferrari dealer panel sign made a staggering £2467-00, which was three times the estimate, with a Maserati one making £1645-00. The Villeneuve nose cone achieved £7637-00, the personnel pass £587-00, and a 1949 Yearbook went at £634-00. 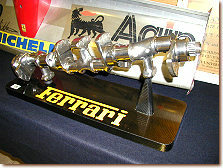 Like the cars, the V10 crankshaft on the presentation plinth failed to reach its reserve. The most extreme price achieved, was for the registration book of the 1952 Le mans winning Mercedes Benz 300 SL in a frame with pictures of team members, that was estimated at £500 to £800, and sold for an amazing £27,025-00.